Companies involved in subsea have seen major cuts in their workforce over the last six years. But as the current oil and gas up-cycle gains traction and the offshore industry recovers, the supply chain may be in a better position to stand up to operators than at any time in the past. This is because the sector now has a sizeable set of alternative and complementary business opportunities, especially maritime renewables. Suppliers can use these opportunities as protection against downturns and price bullying by oil and gas companies. Indeed, in Scotland alone, 265 out of the country’s 652 subsea engineering companies are already in offshore wind, according to recent research from Scottish Enterprise. Optimism is once again in the air in offshore oil and gas circles and subsea is set to do very well. Within five years the subsea oil and gas market will more than double from an annual value of £23 billion to £46-53bn by the early 2020s. And within 20 years, subsea production will level-peg output from surface installations, according to Rystad Energy’s managing partner, Jarand Rystad. At present, 70% of global oil and gas comes from onshore fields. Some 30% is produced offshore, of which one third is subsea. In other words, subsea now accounts for around 10% of overall production and may reach 15% in the early 2020s. 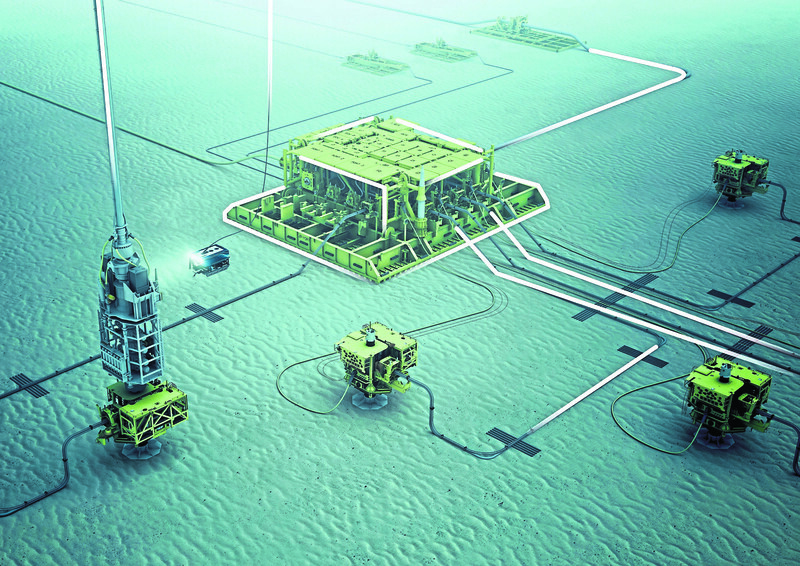 Subsea infrastructure currently delivers about 15 million barrels per day (bpd). It may get to 35bn bpd by 2030 if current and predicted future projects are delivered. Over the same period, output from surface fixed and floating production units is expected to increase from 28-35m bpd, therefore parity will have been achieved. But while the future looks good, life has been tough since the 2014 oil price slump savaged the industry, with at least 300,000 supply chain jobs lost on- and offshore worldwide. Predictably, offshore activity recovery is proving slower than onshore with the result that big hiring campaigns have yet to gather pace. “In fact, subsea-exposed companies experienced employee cuts of 10% in 2017 compared to 2016 – an overall headcount reduction of 32% from the peak in 2013,” Rystad said. New field development approvals are on the rise in the North Sea and worldwide and this is likely to precipitate a “spree of subsea engineering activity”. “Going forward, we see an upside potential of 36% in total subsea awards towards 2020 compared to the awards in 2017,” Rystad said. But the market is rigged against contractors. Cost and risk have been reduced for operators, while more responsibility and work has been transferred to subsea engineering suppliers. Rystad said: “Keeping in mind that personnel at subsea engineering companies have been reduced to 10-year lows, there is a risk of capacity shortage. “Regardless of efficiency gains, there is an increase in subsea activity that requires more working hours to be put down in this field. “Some companies have acknowledged it and started to hire. Others believe that the workload challenges can be eliminated by efficiency gains, like having more experienced workers on their payroll. The uptick in offshore activity combined with ongoing industry consolidation gives reason to believe that backlogs are building up fast for subsea suppliers. That in turn will invariably start to push up prices again, sooner or later. Rystad added: “Subsea companies exposed to the North Sea, which is leading the offshore comeback, are best positioned to experience incoming contracts at higher rates. Wood Mackenzie (Woodmac) analysis points in the same direction. A year ago it highlighted the uplift in subsea production tree orders as a key indicator of subsea progress with 2017’s order book double that of 2016. Its analysts have said that the new norm for subsea tree manufacturers will be in the 250-270 trees per annum range into the early 2020s. Comparing this with just 83 in 2016 is a sure-fire measure of just how tough life was for offshore contractors during the 2014-until-recent downturn. This year, Woodmac expects the North Sea’s recovery to consolidate with more than £14.5bn earmarked for investment in 2019 alone. It expects another bumper year for North Sea final investment decisions (FIDs), with 23 project sanctions in sight – 12 in the UK, nine in Norway, one in the Netherlands and one in Denmark. The North Sea will be responsible for a third of global subsea awards this year alone. Throwing the net wider, it’s not just offshore Europe that’s picking up – Woodmac predicts good times for the US Gulf of Mexico, too. Indeed, 2019 could be pivotal for ultra-deepwater. Chevron’s Anchor project in Green Canyon Block 807 is expected to move forward. Anchor, which has an operating pressure of 20,000psi, would be the first ultra-high-pressure project in the world to reach FID. This would mark the culmination of more than a decade of multiple joint industry research and development projects to design subsea kit that can safely produce at 20,000psi. The current limit is 15,000psi. Success at Anchor would lead to the next wave of mega-investment in the Gulf of Mexico, as several 20,000psi projects are waiting to follow its lead. Woodmac believes that if Anchor moves forward, more than £7.6bn of investment could flow into the region. The UK Department for International Trade (DIT) is keenly pushing Brazil, which remains a hugely important subsea marketplace. The recovery in oil prices and recent licencing rounds are attracting new investments to the market. An example is ExxonMobil, which recently returned to Brazil. DIT reports that the Brazilian Government has been taking action to improve the country’s oil and gas business environment. The country is reviewing its regulatory frameworks to attract more investments by relaxing its local content policy, reviewing and improving the natural gas regulatory framework. It is eliminating parastatal Petrobras’ exclusive rights to operate in the pre-salt area, renewing of special tax regime. This can only be good for subsea, which in the last up-cycle found it very hard to do business in Brazil, recording losses in many cases. That impacted Aberdeen, which remains the world’s leading subsea operations centre in spite of everything.